How does one qualify to join the Bike Tinkers Union? Do you like bikes? Have you, do you, or will you take a wrench, sharp stick, or baseball bat to one? Then you’re probably a Bike Tinker! If you want to join, you know who you are. Amateur tinkerers and professional bike mechanics are equally welcome. All that's required is a desire to customize or improve your bicycles, and an inability to leave well enough alone. 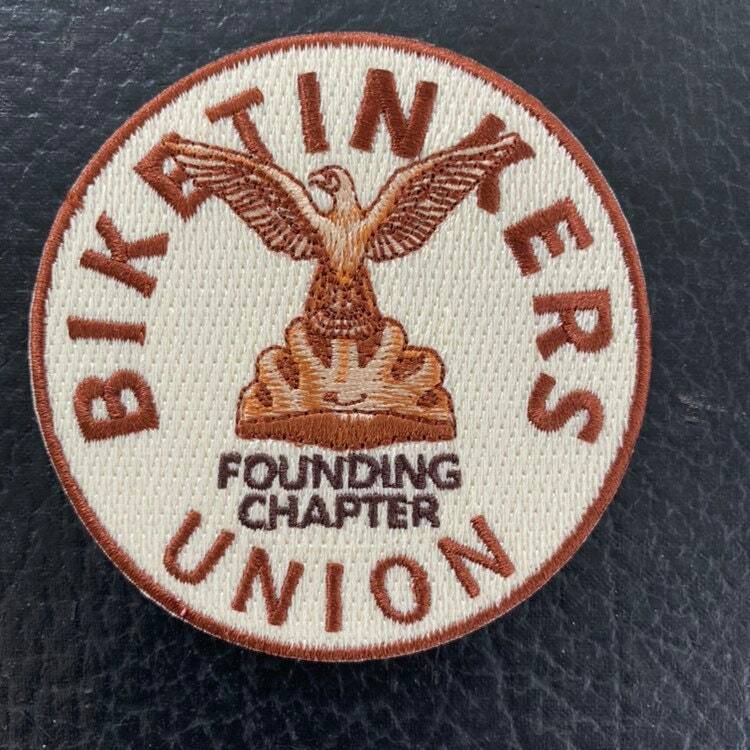 This is a large and detailed patch in a 1930s "union" style. I drew the parts in pencil, assembled them and colored them in the computer, and sent them to my compatriot at Falls Creek Outfitters to have the patches made. Walter there is a real craftsman, and we trade skills. The graphic is an homage to Sheldon Brown, his spirit, his legacy, and his eagle, Igor. Sheldon was a big influence on my biking life, my fixed gear bikes, my weird drivetrains, my engagement with other online bike nerds, and my willingness to risk ridicule and broken parts in the quest to make something just so. He is missed by many, not just me. I was at Bruce Gordon's Swap Meet and Ride, trading patches with some folks from Sacramento, when one of them looks at the Bike Tinker patch, looks at it again, and jumps up and hugs me. "Sheldon Brown! I wouldn't be here if it wasn't for Sheldon Brown!" I hugged him back, "Me too, brother." Very nice patch. Thank you very much.